For me, this is the Year of the Cake Decorator. 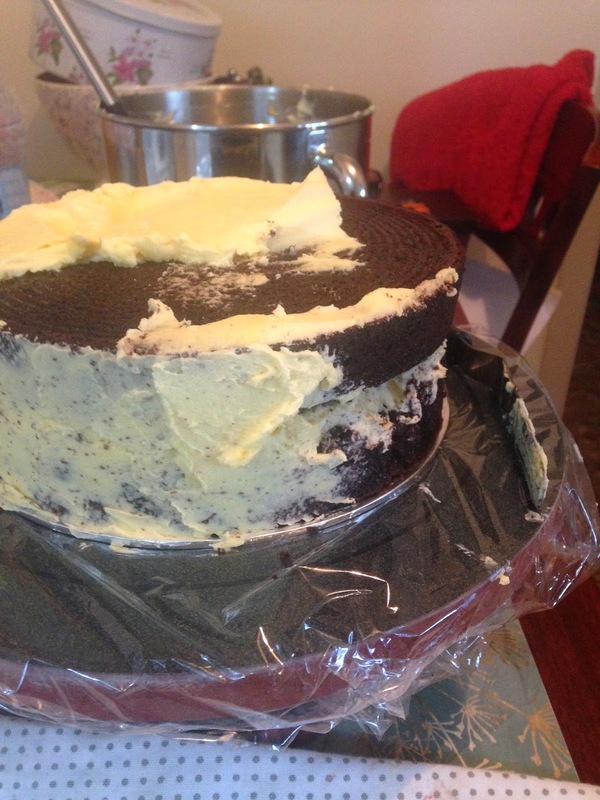 And this is the first of a number of posts chronicling my adventures with amateur cake décor. Be prepared: there will be sprinkles, pastel colours, glitter, flowers, ruffles and all manner of girly stuff to come. Ok, this post is not an original. Both the recipe and cake design belong to another blogger who is by far more exalted in the blogsphere than I. Rosie from Sweetapolita is an inexhaustible source of inspiration for the aspiring baker such as myself - and perhaps you, too? 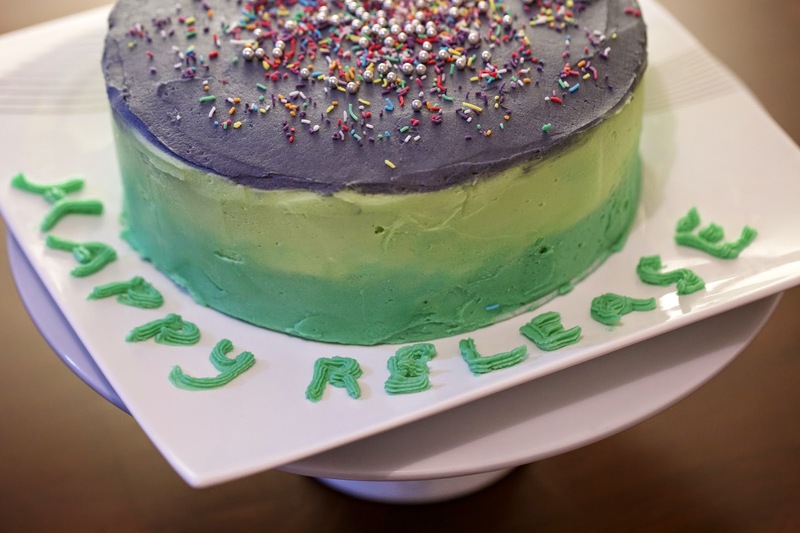 This cake is my first attempt at her Pastel Swirl Cake, and I have to say, getting the swirl right is harder than it looks and I don't pretend to have achieved perfection (by a long shot...). However, the photos, if I may say so, are BRILLIANT. This is due in no small part to the Excellent Plan I made/hinted at in this post, that I was preparing some razzle dazzle for the shots in this blog. May I introduce James, who appears to enjoy photography to the same extent that I enjoy baking! I shall have to find a suitable picture for him, as I currently have none that are just right. So for the moment, relish in the photos, and I'll deal with the details later! Better than an iPhone shot, eh?! 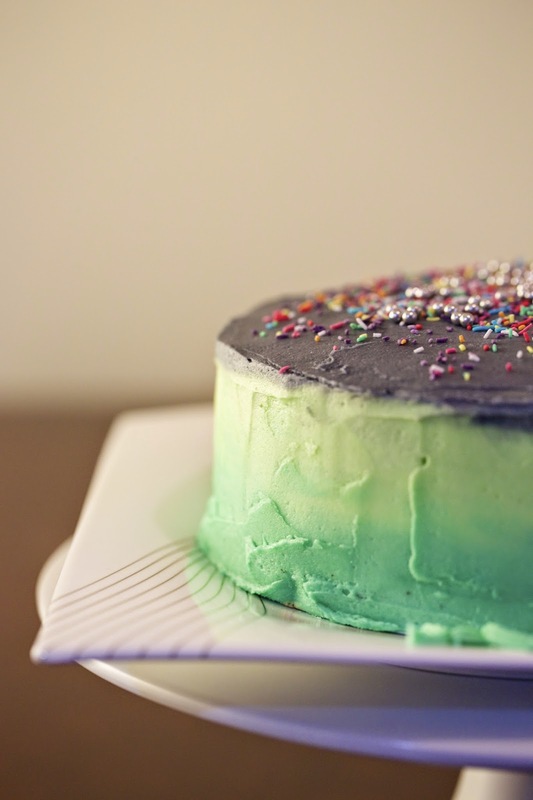 I'll also use less colouring in the icing for the top - so for the top of this cake, I'd use less violet food colouring and add a drop of the teal colour that I used for the sides. Yes, both of the icings used to do the sides are the same colour, just fewer drops for the upper colour. 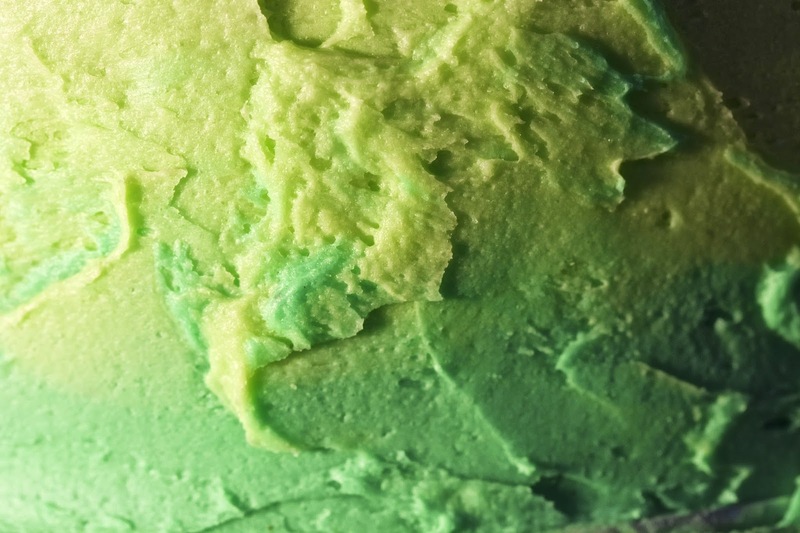 I think the very yellow NZ butter that we have here has affected the shade of the upper colour - it looks more lime green than teal! But icing aside, this is one delicious cake. The recipe is Sweetapolita's Rich and Ruffled Chocolate Celebration Cake. I know that as soon as you click that link I'll have lost you to the pretty pink ruffles that go with that gorgeous cake of hers, but I promise to 'bring the ruffles' in the near future - another fun cake to watch for! This cake was made to celebrate a software release that Nathan and his co-workers had completed - the culmination of 18 months of hard work - and certainly a good cause to celebrate. But I reckon that you don't need a particular celebration or event to bake this cake; I've used this recipe over and over and it gives such a consistently delicious result. Deep and rich but not too rich that you can't eat both the cake AND the icing all in one go (who really has that problem anyway?!). And best of all, no creaming required, you just throw all the ingredients together! 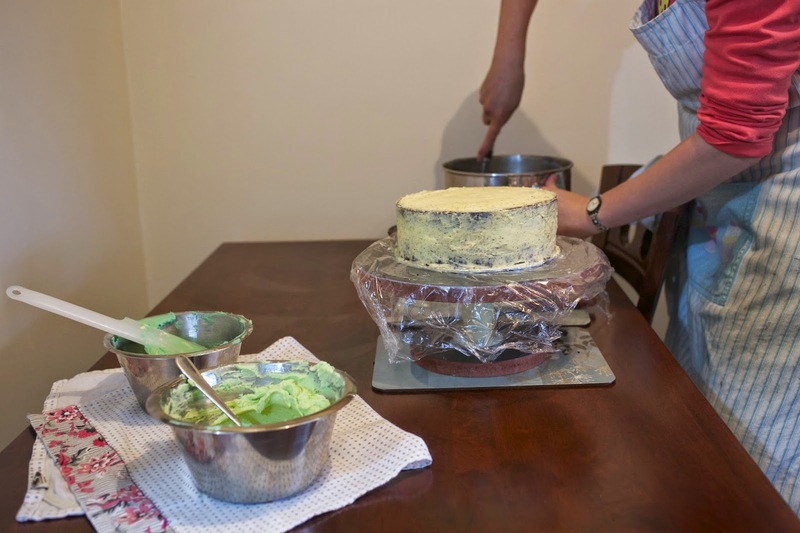 It is helpful to have a cake turntable/Lazy Susan to rotate the cake on, a palette knife or two (straight or off-set) to apply the icing, as well as a thin cake board for the base. 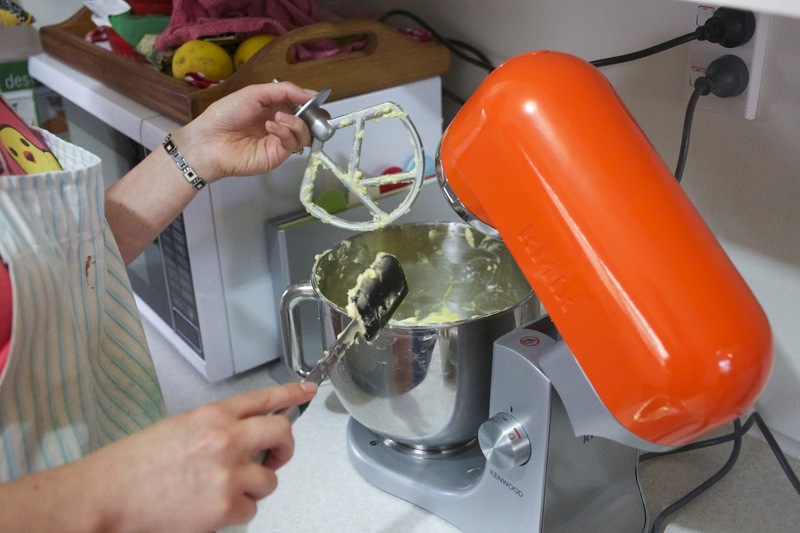 In the bowl of electric mixer fitted with the paddle attachment, sift all dry ingredients. Add the remaining ingredients and mix for 2 minutes on medium speed (you may need the plastic splashguard that comes with mixer). Divide the mixture equally among the prepared pans - batter will be liquidy. 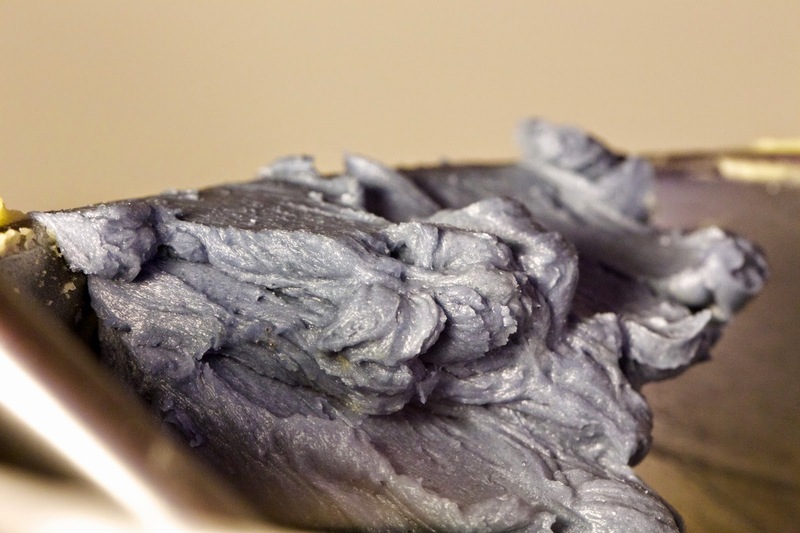 Bake for 20 minutes and rotate pans in oven if you have them baking on different oven shelves. Cakes are done when toothpick or skewer comes clean, after about 35 minutes total baking time. Cool on wire racks for 20 minutes then gently invert onto racks until completely cool. Beat the butter until smooth and pale in a bowl with high sides (this takes approximately four to five minutes in a stand mixer or with a handheld mixer). Gradually add the icing sugar half a cup at a time, beating each time and adding a little hot water when it becomes difficult to beat. Make sure you scrape the sides and base of the bowl in between additions of sugar. Add the essence for flavouring to taste after the last addition of icing sugar. Set aside approximately one third of the icing (around two cups full) in a bowl for the crumb coat. Divide the remainder of the icing equally between three different bowls to prepare the three different coloured icings for this cake plus some for the crumb coat. 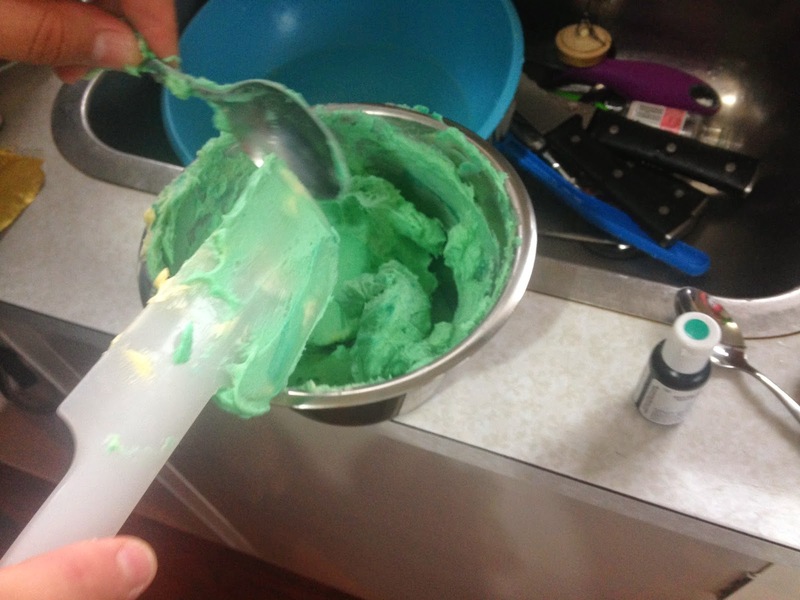 Add a few drops of food colouring to the bowl with the icing that will cover the lower part of the cake and stir in with a spatula until the icing is coloured evenly. This mixing is hard work! I use a gel colour to get a more intense colour and because there are more colour options available. I must admit that I can't recall exactly how much icing I made up when I did this cake - the quantities above should be sufficient for doing the top, sides and crumb coat. 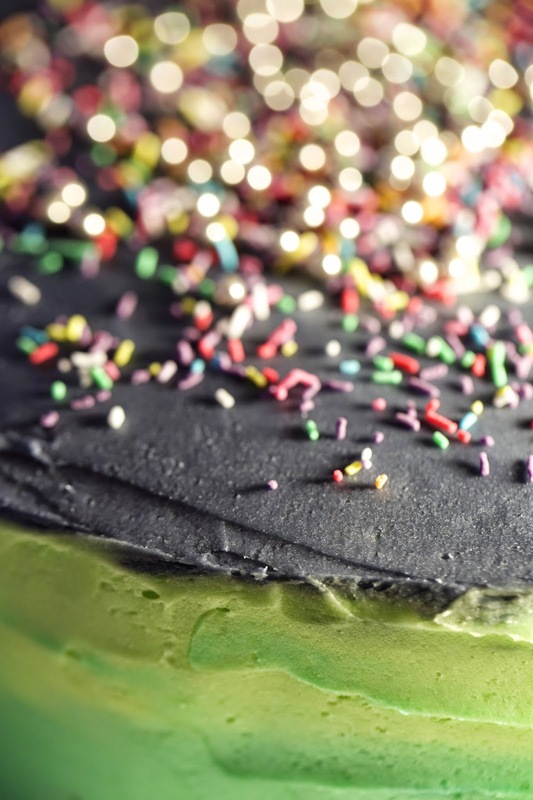 You want to make sure you have about two cups of icing altogether for doing the crumb coat and filling between the layers, and one cup of icing for each of the different colours. If you think you'll need more after setting aside the crumb coating icing, make up an extra third of the recipe (150g butter/margarine, 2 cups icing sugar, etc). If you're really worried that you won't have enough, I recommend making up one third of the recipe to start with for the crumb coat, then make up the full amount of buttercream and split it into the three quantities for colouring. I'll have to double-check those quantities sometime by making this cake again...a trial, I know, but one I'm willing to take on ;-) If you do make too much icing, store it in a plastic container in the fridge for a couple of weeks if you can use it within that time. *As I said earlier, I'd prefer to use margarine as a butter substitute for this recipe so that the icing is softer and easier to use. I do think that it needs to be a dairy-based margarine - not just so that it is actually butter-cream! 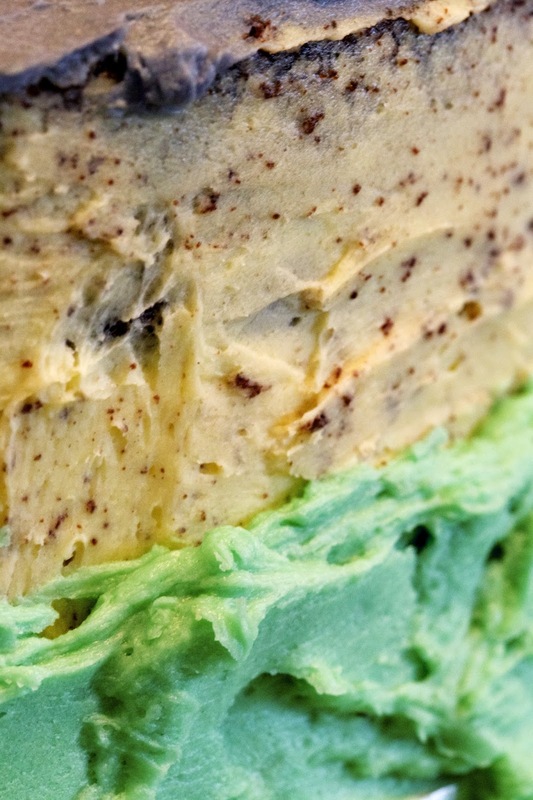 The animal fat in dairy-based spread sets icing better than vegetable fat-based margarines and prevents the icing from seperating - like it did when I used low-fat cream cheese in the icing for this recipe! I like Country Soft range because they use buttermilk in the margarine, which whips up beautifully in a mixer. Thankfully, the 'lite' version works equally as well as the full fat in this recipe. Please note: this is not the best icing for piping. I recommend Swiss Meringue Buttercream icing for cakes because it will give you a flawless result without 'cracking'. I'll cover it in a later post but Rosie also provides great step-by-step instructions here along with more beautifully iced ruffles! Place your second cake on top of this layer of icing 'filling'. Plop another dollop of icing on the top and smooth it to the edges, using a large palette knife. 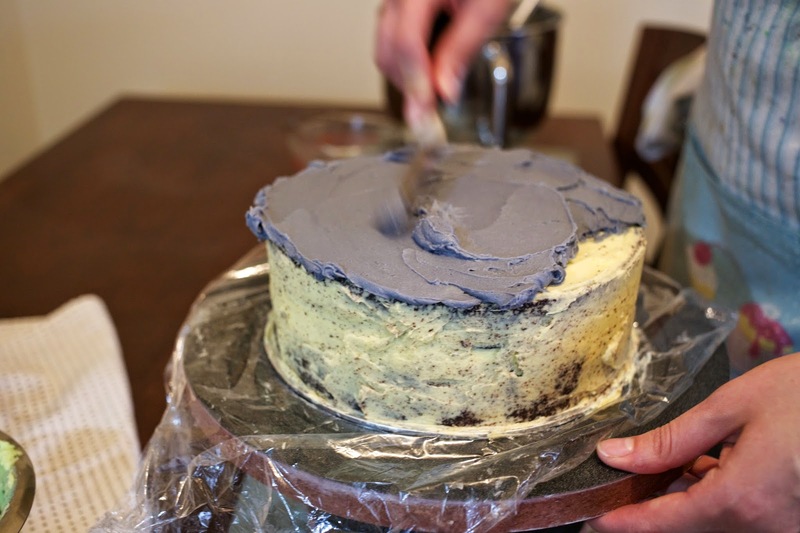 Next load up your palette knife with more of the crumb coat icing and hold it flat against the side of cake while rotating the turntable so that your knife remains still and the icing adheres to the sides. 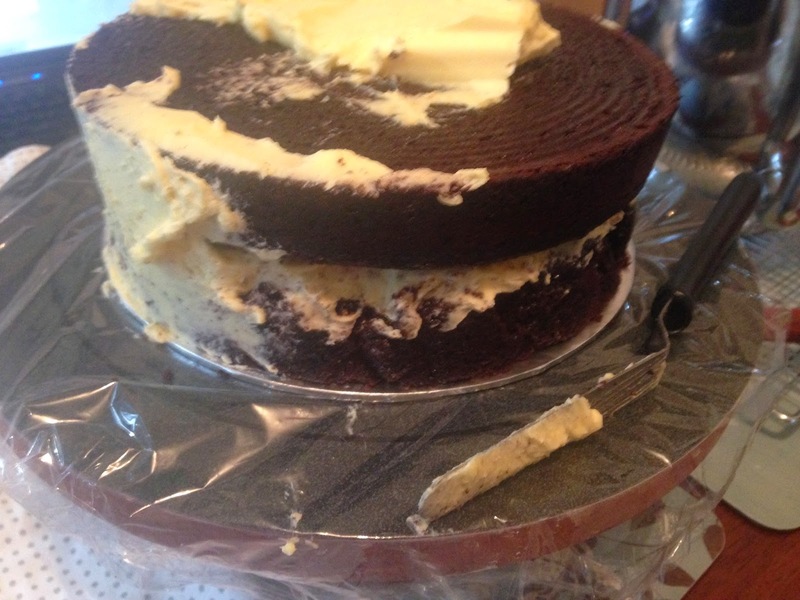 Fill in any gaps around the middle of the cake where you can see the filling layer. Ready to start the fun part! 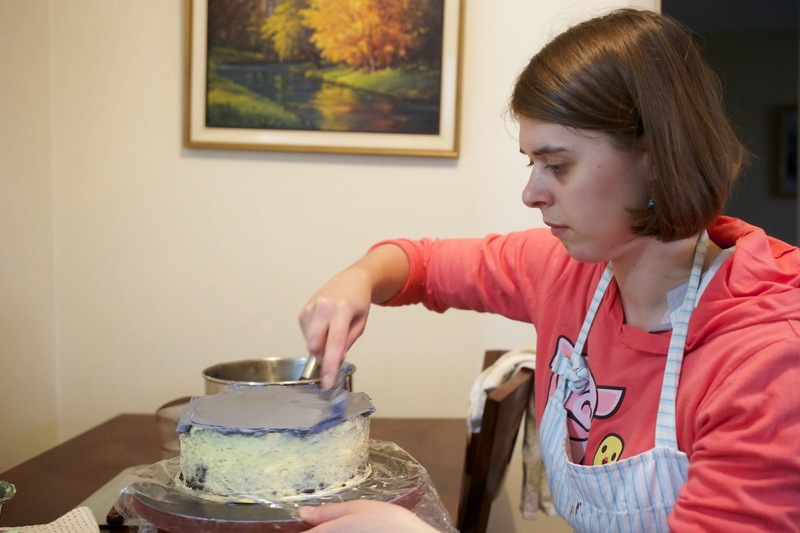 To 'dress' the cake with the coloured icings, I highly recommend watching Rosie's great video tutorial. This is the sort of thing that's difficult to describe with words alone! And there are already plenty of words in this blog post. 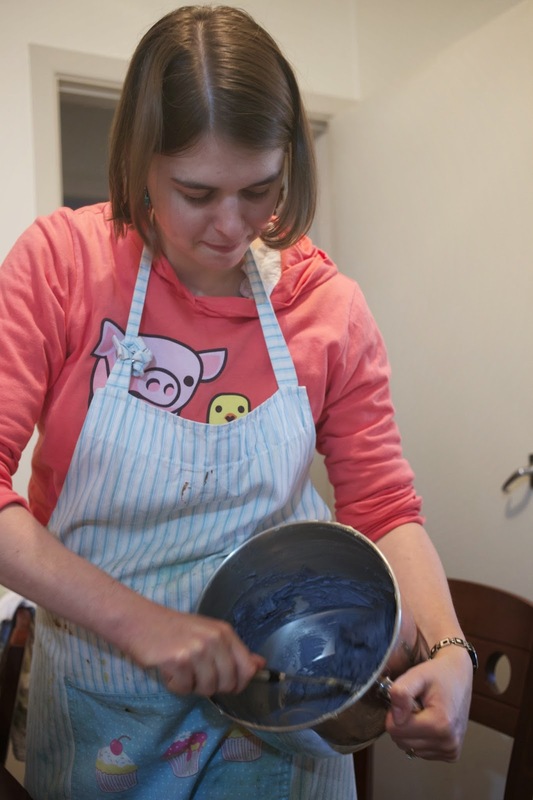 So here are some captioned pictures of me applying the icing according to Rosie's instructions. It's all about using multiple strokes and keeping the turntable moving. 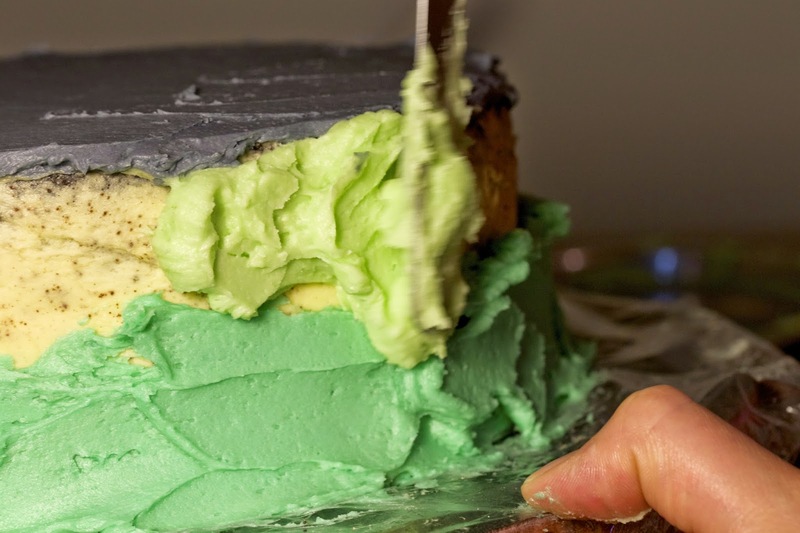 As per the crumb coating, place a (generous) dollop of the top colour onto the top of the cake, and spread it to the edges, applying it thickly. I used and off-set palette knife/spatula and spread around in a circle while rotating the turntable clockwise. Scrape the icing off the top edge so that it doesn't droop down the side of the cake - yet! 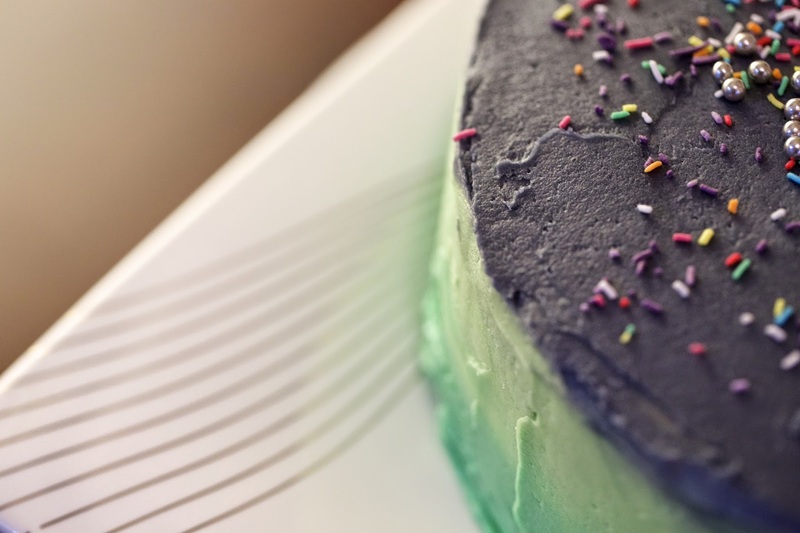 Make sure you frequently scrape off extra icing onto the edge of the icing bowl. Second, add the bottom colour, applied thickly with lots of strokes. When applying the 'middle' colour, let it spread a bit onto the bottom colour. Again, add a LOT - you can always scrape excess off, but it your excess colour has mixed with another, make sure you don't accidently re-add it to the cake again. Blend the side colours a bit with many forwards and backwards strokes of the palette knife. I've been told that this is the 'serious baker'-face! 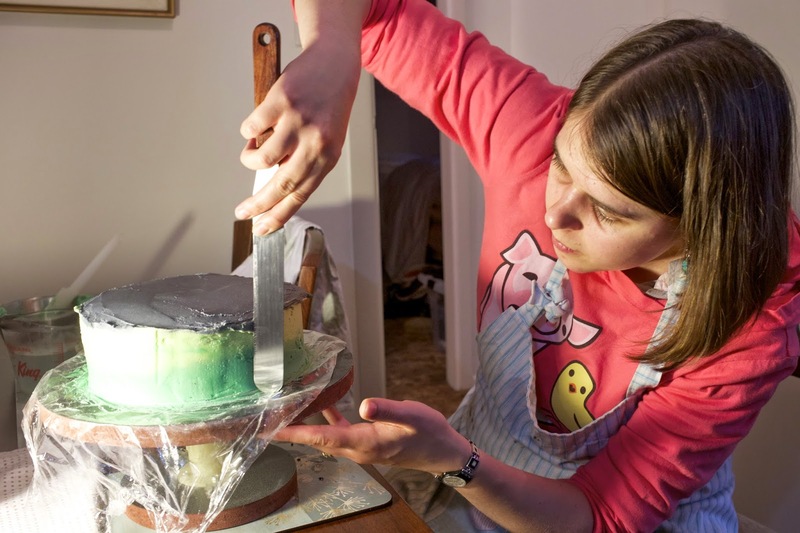 I'm smoothing the sides of the cake while blending the top colour into the sides a little from the top edge. And there you have it - not the easiest cake but certainly lots of fun. 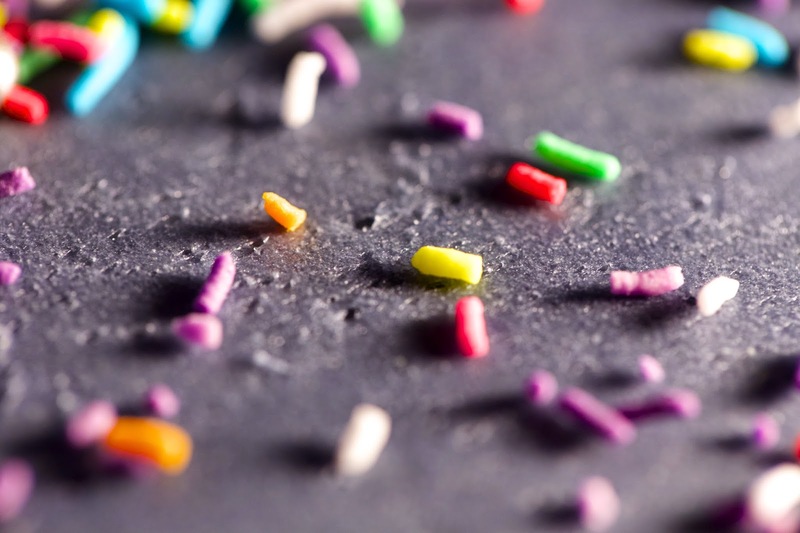 This would look great with shades of yellow and orange, pink and red, blue... and although the sprinkles and silver cachous are optional, they make a great finishing touch. I can't wait to try it again, and I hope you're up for giving it a go! 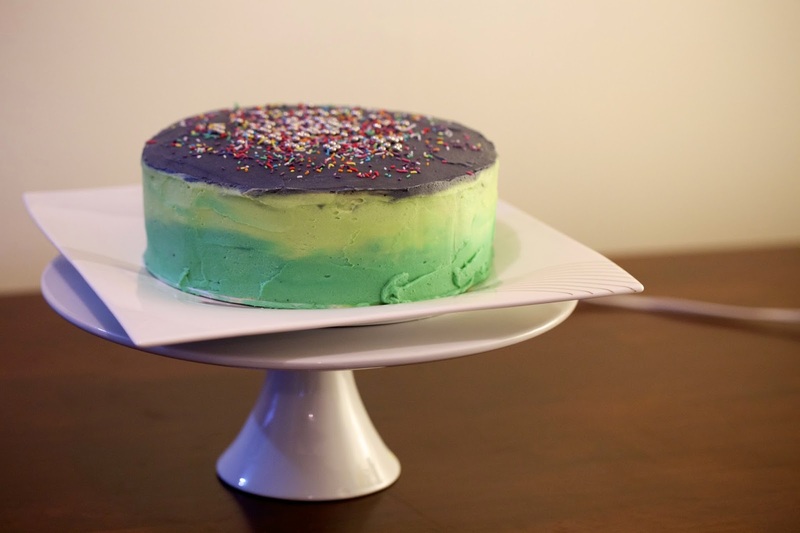 I didn't use your recipe, but i thought of you while i made my version of an ombre swirl cake! I did use liquid food colouring though which made it a lot more pastel. Ended up mixing 4 different shades of greenish yellow which in hindsight was maybe overkill as it was all quite pale anyway. Next time will try gels, if time permits. Hey Cheryl, it's amazing what the slightest addition of food colouring does to icing, so I'm sure the colour graduation of your cake was super with FOUR shades! I recommend gels because of the range available - have you got some already or do you know of where you can buy them?